My good friend and Enjoy Food & Travel co-writer Susanne Koch had a weekend in Bordeaux a few weeks ago, and brought home a pretty special bottle of wine for us to enjoy at my summer home. 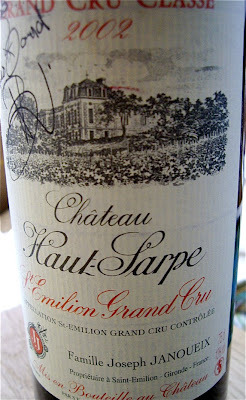 A signed bottle of Chateau Haut-Sarpe Grand Cru 2002 is a wine out of the extraordinary, and signed by the owner. I am not a great fan of wines from the Bordeaux region. If you want a really good bottle from this region, you will have to pay a larger sum, often better spent on a quality wine from countries like Spain, Portugal, Australia, South Africa or the US. This wine estate belongs to Joseph Janoueix, and is one of the great household names of the Libourne area; they are as well known for making wine as for being wine merchants. This wine was a blend and one of the grapes used was merlot, one of my favourites. I found Chateau Haut-Sarpe a complex wine. Rich red berry and pepper aromas and a distinct tannin character.